Chris Eyerly has built an excellent model of the Laurent House, a lesser-known work by Frank Lloyd Wright, built in 1951 for Kenneth and Phyllis Laurent. 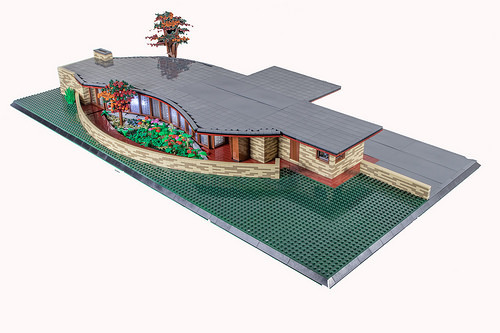 Chris has used some unorthodox techniques to capture the flowing curves of the house, particularly “brick bending”, in which many 1×2 plates are connected to form a wall, then the wall is bent into a curve, taking advantage of the tiny gaps between each piece. It can be challenging to capture curves with a system based on squares, much less integrate the curves with the square sections without ugly gaps between the bricks, but Chris has done a perfect job here, all while staying true to the original design.